Maryland Pink and Green: Giveaway! Is it possible to be organized during a busy holiday season with multiple schedules to manage? Absolutely! 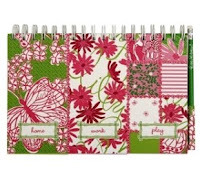 Have a chance to win this adorable Lilly Pulitzer Home/Work/Play Lilly Pad in the super preppy patchtastic pattern! Help keep your life a organized in style! As many of you know, I am a HUGE Lilly Pulitzer fan and love to make Lilly part of my lifestyle in every way. From the clothes, shoes, accessories, and paper goods line, my entire life is Lilly-fied! Notice I also like to invent words! I adore the new stationery line and wanted to include my readers. This 3 note pad is one of my favorites and I bought an extra one to give away to YOU! So what do you have to do to win it? Get up to three chances to win. Tell me about how you make Lilly part of your entire lifestyle in a comment and earn one entry. Become a follower and earn another entry. If you’re already a follower, you already have one entry! Write a paragraph (this does not have to be long at all) about your Lilly lifestyle and mention my blog and this contest on your blog and earn another entry. I will stop accepting entries on next Tuesday, December 22 at 11:59 pm EST. After entering all of the comments on random.org, I’ll announce the winner on Wednesday, December 23. One lucky preppy blogger will get a nice surprise to start off the new year! I love "lilly-isms!" My favorite is "Oh! Shift!" I use it instead of cursing. I also love the thank you cards. I'm mentioning your giveaway on my blog! Just signed up to follow your blog. Found the link from the Lilly Facebook fan page. I will mention your blog on my blog too. Wish I had more tme to blog. I definitely live a Lilly lifestyle even though I live in NH. I wear something Lilly everyday! I wear Lilly perfume, clothes, accessories & PJ's. My 2 year old daughter Olivia & I love to wear matching Lilly as often as possible. Happy Holidays! Wishing you a pink & green Christmas filled with Lilly! Adorable! Lilly influences the fabrics I choose for all the jewelry I make, the colors inspire me. And, of course, I'm a sucker for pink and green anything! PS. I'm a follower too! I love the themes that lilly has for her clothing. I have a few pieces and I have her entertaining books. I have the stationery that makes me enjoy the art of snail mail. I try to keep the colors from getting too dark. lilly is full of color and brings a smile to peoples lives. I meant to write that I am a floower too. Welcome everyone! Thanks for reading my blog! It's so wonderful to find other Lilly lovers. @Suburban Prep The entertaining books are the best. @Sue I like to match with my daughters, too. People always compliment matching outfits so much. @Miss Pearl The new Lilly-ism I love is LYTM, love you too much! Lilly is a huge part of my lifestyle because the majority of my clothes are Lilly and almost all of my office supplies are too! I have even made friendships with random people that are wearing Lilly that started with "Oh that is one of my favorite patterns!" Lilly truly makes the wearer and people around them happy! Hey! Such a cute giveaway! I absolutely love Lilly and wear it every season! My closet is full with Lilly and I love wearing it because it not only classy but it puts you in a good mood! Lilly has been a part of my life since I was born. My mom use to dress my sister and I in matching Lilly outfits! I hope to pass on my Lilly and new Lilly to my children one day! Thanks again for holding such a great giveaway! Hi Bethany! What a fun giveaway and love your blog! :-) As you already know, Lilly is a huge part of my life. I wear it every day, even if I never leave the house I'm in PJ's or a Lilly tee. Living in the south AND on the coast, Lilly is appropriate for every event in my life. I don't understand those who say "all your clothes are so BRIGHT"....like what's wrong with that?? Best wishes for continued success and have a great weekend! Lilly office supplies play an important role in my daily life. I love lilly and try to make it part of my life by always wearing pink and wearing pastels, pearls, and kitten heels! I love Lilly paper products. At school I'm always seen with the brightest backpack full of Lilly products. They just make studying so much more fun. And being from Florida I always try to incorporate at least a little brightness into my wardrobe, usually resulting in plenty of Lilly! And I'm now a follower, and love what I've seen!